There is no denying it: LEGO is awesome and one of the most recognized toy brands in the world. The simple appeal of these plastic bricks has gained the love of people of all ages. As sad as it is though, an inherent problem keeps infants and toddlers from joining the party. LEGO pieces are small, and are a choking hazard to little kids who love putting stuff in their mouths. They cannot help it; they are satisfying their instinctual need to learn about the world! Faced with this dilemma, LEGO needed a solution. Then, came the people from the planet DUPLO. Bigger, tougher, but still made of the same design, DUPLO LEGO sets are designed for kids aged 1½ – 5 years old and are less likely to be swallowed. They are as popular as their smaller counterparts are; they are even getting a big role in The LEGO Movie 2. Before that, though, let us take a trip down brick lane and look at some of the best LEGO DUPLO sets! Trains have actually been a big part of the DUPLO line for years. Some of the most popular LEGO DUPLO sets have actually been based around trains. LEGO even did a sub-theme based on Thomas the Tank Engine at one point. It makes sense, then, that the Brick Pals favorite would be a train set: the DUPLO Steam Train (10874)! Made from 59 colorful pieces, the DUPLO Steam Train is divided into several features. There is the train itself, the tracks it runs on, a train station and coal tipper, and the accessories. The station measures at 5″x4″x2″, while the train is 3″x11″x2″. The cool thing about the train itself is that it is push-and-go. Push it forward on the tracks, and it will move along. Grab onto it, and it will stop. As a bonus, it comes with five action bricks that can make the train do various things: turn on the lights, sound the horn, or change course. For 2-5 year olds, this can be some of the most fun they have ever had! 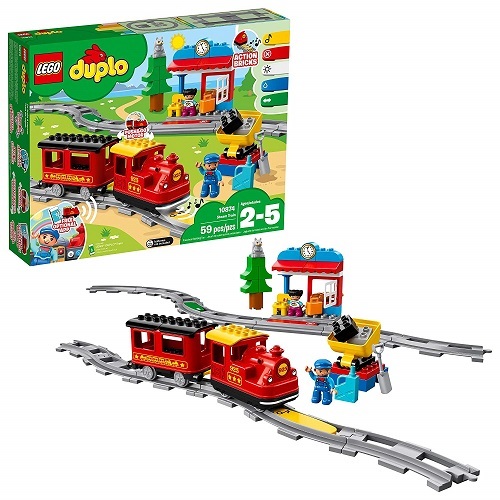 To sweeten the deal even further, the set can combine with other DUPLO train sets, making it bigger and more fun! LEGO also included a phone app that comes with remote control functionality and games. That is a great deal! There comes a time in kids’ lives when they will be infatuated with a type of vehicle. For some, its planes; others like trains, and automobiles. This set encourages that fascination among kids, and gives them some valuable time stoking their imaginations. That app can extend the playability of the set as a whole by giving kids games to play. Combined with it connecting to other DUPLO train sets and they can have fun for hours. I wish I had this set for myself when I was a kid. I was into trains and LEGO in my childhood, so this would have been perfect! Hey there, true believers! It looks like that shifty menace Sandman is trying to make off with a very important briefcase from Hulk’s lab. Hulk is not worried, though, because Spider-Man is here to help! Riding his Spider-Cycle, Spider-Man will web up Sandman to make sure he does not get away, while Hulk will smash him if he does. Evil is no match for heroes! This 38-piece set is not very big on pieces, but that is common with DUPLO sets. As far as size goes, though, it is decent. Spider-Man’s garage measures at 9″x4″x1″, while Hulk’s lab comes in at 3″x2″x1″. The main accessory comes in the form of the Spider-Cycle, measuring at 1″x3″ and under 1″ wide. It has a few other accessories, but the other big one is a flexible spider web. There is enough to entertain kids ages 2-5 here. On the surface, the main benefit is that it teaches kids about Marvel Comics and fosters a lifelong love for their characters. If not lifelong, then at least for most of their childhood. Beyond that, though, this serves as a way to help children master basic building skills that they will need for LEGO. This looks like a fun little introduction to the world of superheroes, and given how popular Marvel is, this seems appropriate. Does your kid want to go outside to play at the park, but you are too busy to take them? Alternatively, is the weather not good enough to play outside? Then bring the fun indoors with the Large Playground Brick Box! A novel feature found in many LEGO DUPLO sets is that they come in plastic boxes that double as containers. Such is the case with this 71-piece set. Kids can dump the pieces on the floor, and bam, they are all ready to go! Once finished, the Brick Box set can create a playground of adventure. It’s got a treehouse and slide that stands at 7″x11″x5″, standing next to a bouncy car ride. Nearby, there is a working swing set. Standing at 6″x5″x2″, it has a windmill that actually spins. That is the kind of thing that kids 2-5 will go crazy over playing with. Top everything off; this set has two child DUPLO figures, perfect for playing on their playground. They can swing on the swings; go down the slides, and more! Aside from the swing set and bouncy spring car, the main benefit to this is the plastic box and the colorful bricks. Kids are going to like things that have a lot of color in them, and this more than provides for that. The other benefit is the bin it comes in. When kids finish, they can put everything back inside the bin and put it away without any mess. It is that easy. This looks like one of the best LEGO DUPLO sets, and the sort of thing that kids will enjoy. Another successful DUPLO set! This is not an actual set, in the sense that it is meant to build something specific. This set is meant to be a gateway, a door to the world of LEGO for infants and toddlers. As such, it is optimized for that. This 33-piece set is for ages 1.5 and up, so it’s an introduction set. As such, there are not that many complex pieces present. It does have some unique features, though: a cat, a window, and a kind of flower piece. These are all meant to spark a child’s imagination. This set does not offer much in the way of building, but since it is for babies and very small children, it does not have to. The plastic bin it comes in doubles as a storage container, as with several other sets on this list. It has enough to keep little kids entertained. Parents who are trying to choose their kid’s first LEGO set will want to consider this. Ah, the annual fair, one of the most exciting things a kid can go to. The sights, the sounds, the cotton candy and Ferris wheels! They are all so much fun! 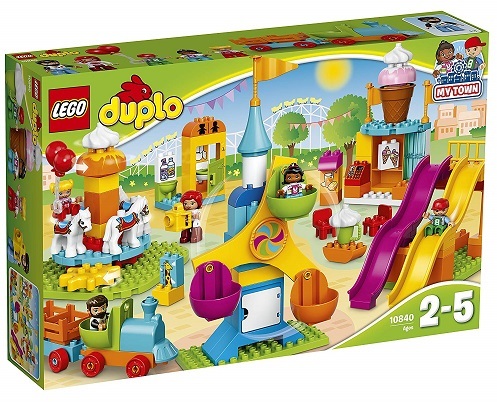 Now, kids can capture that fun with the Big Fair DUPLO set. It is more than colorful sets, though; they have moving parts. The Ferris wheel can turn like real ones. Same with the carousel: it spins around! The train moves, and the ice cream stand has all these colorful bricks! It even has a restroom, table, and chairs. The best part is that this is only one part of a larger set. Combine it with the DUPLO Shooting Gallery, and the fun will get even better! 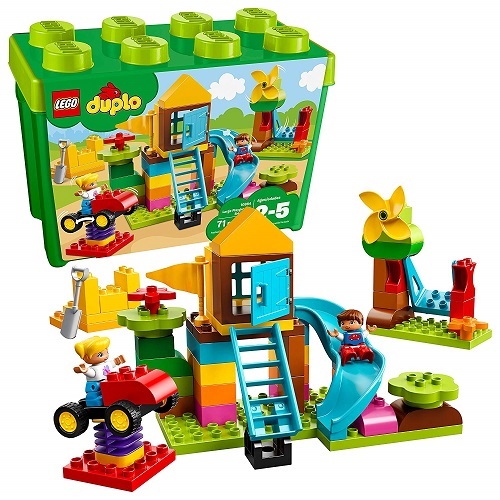 In total, the set comes with five DUPLO figures, and there are plenty of activities for them to do. The main benefits to this set are its size and the number of DUPLO figures it has as a part of it. This set is bigger than most DUPLO sets, so building it will be a test of a kid’s skills. The results will be worth it, though! The movable parts make this a barrel of fun for any kid. This is necessary buy for any LEGO-loving parent. Their kids will have fun working with it and will thank you for the fun. 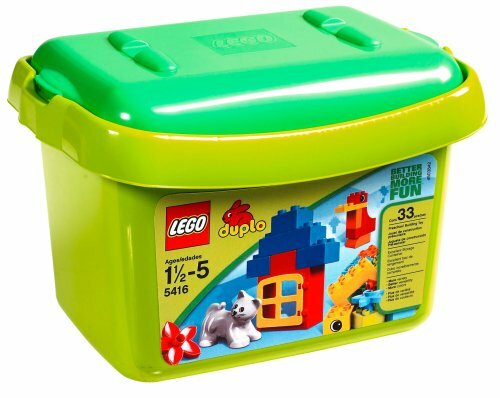 Three for three, it is another DUPLO bin, the All-In-One Box of Fun! This 65-piece variety box is filled with plenty of bricks to play with. The main thing that is built with this set is a house and a wagon. At 5″x4″x3″ and 1″x3″x2″ respectively, they are a decent size, considering the number of bricks in the bin. It does have a dog and a boy though; they are only an inch tall, but that is fine. It is meant for kids ages 1.5 and up, so they should be entertained. The benefit to these variety bins is that there is never a set way with which to build things. This helps to encourage their creativity and learn how to express themselves, valuable skills to have in life. Who knows? They may end up having a talent for LEGO building and do it as a career. People do that. These variety bins are a great way to introduce kids to the wonders of LEGO. Parents should buy them for their kids and watch them go to town! “We are from the planet DUPLO, and we are here to… destroy you”. With those words at the end of The LEGO Movie, the DUPLO aliens invaded Bricksburg. Or rather, Finn got his LEGO creations invaded by his baby sister, which was not awesome. Now they have made DUPLO versions of Emmet and Lucy and are trying to capture them. 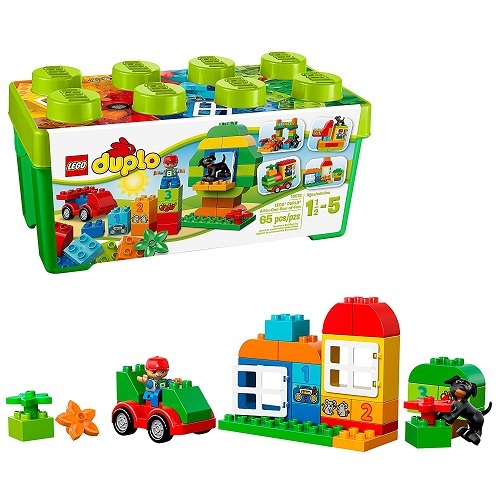 DUPLO is going to play a big role in The LEGO Movie 2, so this set is a clever way of building on that. There are four DUPLO aliens shown on the front of this 53-piece set. Meant for ages two and up, it is a barrel of fun. 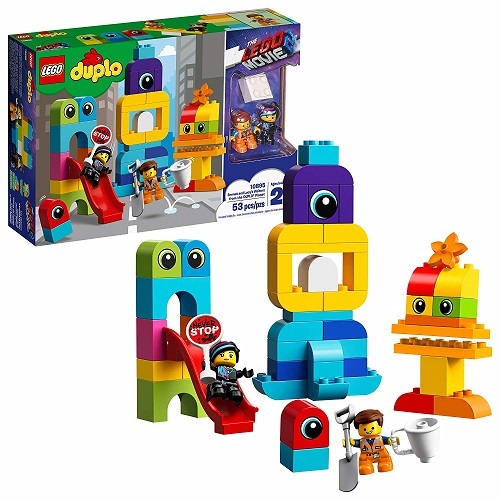 The biggest DUPLO alien stands at 9″x5″x2″, while another one has a slide for a mouth. Emmet and Lucy can ride that thing! Like The LEGO Movie shows, though, you do not have to remake the aliens the same way. They can become anything they want, or what kids want. The creativity is endless. The main benefit to take away from this set, aside from being part of a movie that will be awesome, is the level of freedom it gives. The DUPLO aliens can be remade into countless combinations of new forms to suit a toddlers needs. They could create something amazing never done before! They could create a mega DUPLO alien! It is awesome! This is a good set for parents to get their kids, as it encourages kids to explore their creativity and is perfect for anyone interested in The LEGO Movie 2. Everything is awesome with LEGO. 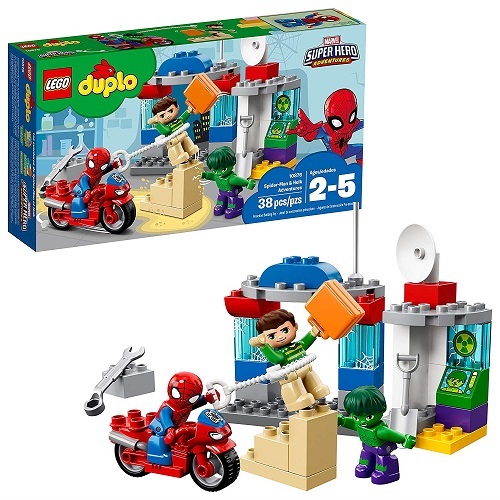 Find our choices of the 7 best LEGO Duplo Sets (updated 2019), including; a steam train, spider-man and hulk adventures, boxes, the big fair and more!